I think I have said this before: I am very lucky to have such an excellent neighbor. We chat at least three times a day on a range of topics. On Friday morning, as usual, I called her up. The Rain Shadow bird I had waiting in the fridge was petite – too small for all of us. So, I went to Whole Foods, where the butcher convinced me to take advantage of the sale, roasting chickens at $1.50 per pound, a suspiciously low price. (In contrast, the Rain Shadow bird cost over $20.) There was a vast pile of chickens, in green cryovac, rated Level Three. At Whole Foods, Level Three means they have access to the outdoors during the day. (I am not sure the chickens know they can actually go outside – they just have a door.) 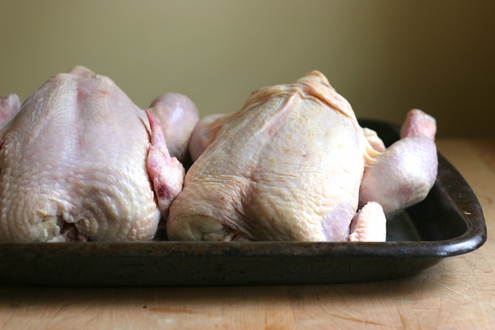 This chicken looked unappetizing, suffocating in its plastic wrapping, partially frozen, and enormous – a six pounder. I have a bias against large chickens, which may be somewhat unfair but the talk about growth hormones makes large chickens suspect. Sighing and with no time to dash off to my favorite butcher, I asked the meat guy if he would remove the plastic please, and rewrap it in brown paper. He rolled his eyes at me. Whatever! Cryovaced meat and the inevitable pink juices, ugh. I consoled myself. 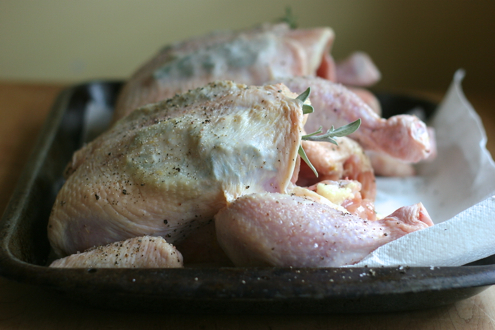 Really, how bad could a Whole Foods bird be? At home, I pulled the paper from this wet, pinkish bird and it was hard not to compare it with its Rain Shadow cousin, a pampered, little thing from a small farm in Ephrata, that had spent its life pecking up bugs and grubs. Its skin was pale, yellowy cream, and dry to the touch. Look at them sitting there next to each other. Actually, in this photo, neither one looks bad. The one on the left, plump and pink, the one on the right, slightly wrinkled with a yellowish cast, a bird with a slightly better pedigree. 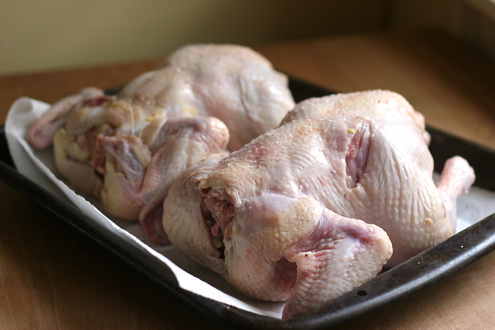 But when I flipped them over, I discovered the sloppy butchery on the Whole Foods bird; its back gashed in two places. Despite the obvious damage to the flesh of the chicken in the foreground, I got them ready to roast, first rinsing and drying, then gently pulling skin away from flesh and pushing sage and rosemary underneath. Finally I rubbed the skin with kosher sea salt and black pepper and left them in the refrigerator under parchment for several hours before sliding them into a very hot oven. (Kind of like a fancy spa treatment!) By this time, Mrs. Pierce had crossed our shared driveway bringing the tequila and Triple Sec, Martin was squeezing limes and I was in the middle of constructing a variation of the ridiculously good Green Couscous from Plenty. Dinner got later and later and I didn’t take any more pictures. Mrs. Pierce and I discussed the birds over dinner. When they had rested after coming from the oven I cut them into pieces and piled them high on a platter – scattering their crisp salty skin with chopped parsley. By the time they were this burnished and bronze, (also, perhaps because of the margaritas) it was hard to tell the difference between the two. Nibbling on a wing as crisp as a waffle-cut potato chip, I decided that this method of cooking a chicken is the best method and even a battery hen might taste ok with the same treatment. So. Next time how will I choose? How does anyone? Convenience? Rain Shadow is closer. And QFC is even closer than that. Price? Nobody looks at Rain Shadow or Whole Foods for bargains. Flavor? It’s very important to me and when I’m paying attention (by that I mean NOT celebrating National Margarita Day) I can tell the difference between a posh chicken and a battery one, but I’m pretty sure I’m in the minority. Most people are concerned with other seemingly more important issues. I know one thing. Most people don’t have the luxury of swanning around town comparing chickens. Even I, an extremely discerning (picky!!) person with time on her hands, didn’t have time to cross town and buy another $20 chicken. And most people can’t or at least don’t want to spend their money this way. I bet anyone would agree though, that chickens should be able to poke around for worms, flap their short wings and socialize. (Sort of like me and Mrs. Pierce.) Anyone who has seen the footage of life in battery cages, knows it’s the wrong way to treat living creatures, not to mention the environmental damage sustained from raising animals that way. I have no idea what to do about the chicken problem except save my money for the occasional sustainably raised bird. While I am thinking about that, why don’t you try this Green Couscous. And if you can’t wrap your head or your wallet around a happy $20 chicken to go with it, that’s ok. Just toss in some crumbled feta. If you haven’t bought a copy of Plenty, click here, and change your culinary life forever. There will be no problem with buying chickens as all the recipes are vegetarian. I would double this, even if serving four, because the leftovers are so excellent and I write this as a person who is not crazy about leftovers. Cook the couscous according to the package directions, spread on a large platter or sheet pan to cool. Sauté the onion over medium in 2 tbsp extra-virgin olive oil with salt and cumin until golden and soft. While the onion is wilting, put the parsley, cilantro and mint and 6 tbsp olive oil in the food processor with a pinch of salt. Puree. Stir the herb puree into the couscous. Stir in the wilted onion. Toss in the arugula, pine nuts, jalapeño, green onion and optional feta. Season with salt as you see fit. This entry was posted in easy, Uncategorized. Bookmark the permalink. I have similar chicken purchasing debates with myself. I shop at the central coop where the chickens are probably living better than those from Safeway but not as well as at rain shadow. I do love rain shadow. Thanks for the couscous recipe, I love the addition of the jalapeño! It’s been a tough realization that maybe driving the extra few miles to Whole Foods really isn’t good enough. It would be so great if there were a carte blanche to shop somewhere where you didn’t have to ask questions! There’s no getting away from it though. I hope you have that book Plenty or his next one, Jerusalem. If I had to pick one cookbook, one of those two might be the one! Wow, Sonia doesn’t fool around! she gets her chickens right at the source, the coop! Wow~ what a fun life you guys must have, eating posh birds and drinking margaritas! Do you even watch tv togehter?